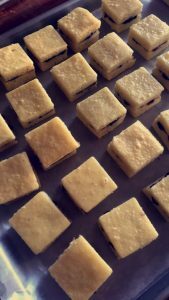 Petit fours are small layered cakes, usually made from pound cake, with jam in between and coated in chocolate. They’re small… which obviously means you get to eat more (yes!). These cute little cakes are a beautiful addition to any party – adding a special touch for the dessert table. 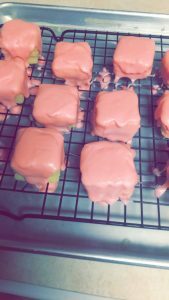 Making petit fours is wicked easy – especially when we use the box cake mix as a hack. Wait – what? A BOX CAKE MIX? Is it really that easy? I know – I’m excited too. Mix the cake mix, pudding, eggs, vegetable oil, and water in a bowl. Empty batter onto a greased cookie sheet and bake at 350 for 20-25 minutes (until cooked). Let cool and cut little squares out of the cake. Spread jam in between two layers. 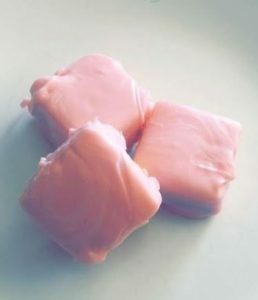 Melt the candy melts in the microwave (it usually take 2-3 intervals at 30 seconds each) and add into the coconut oil (this helps the melts spread more easily). Simply pour over the cakes and allow to harden. You can keep these in the freezer for up to 2 weeks in the freezer before you party… assuming you don’t eat them all.